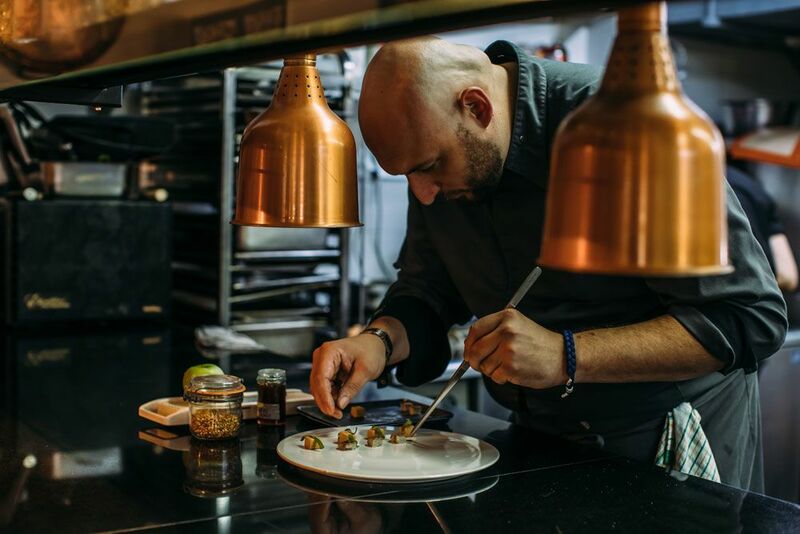 Chef Jérémy Gillon makes Singapore his new home and helms a new restaurant in Little India. Audace’s (short for audacity) not only scores with its vibrant location at Wanderlust Hotel in Little India, it's also been designed to instantly make you feel at home. Gone are the starched white sheets you'll find in fine dining establishments, and in place are bare tables and multi-coloured steel chairs that accentuate the raw, slightly rugged interior. Enter the restaurant and the first thing that will draw the eye (pun intended) is a painting of an eye on the wall, which according to executive chef Jérémy Gillon’s, represents his hope that guests will adventurously explore the interesting menu made up of different cuisines and ingredients. In fact, Gillon has a collection of 24 French herbs, which ranges from verveine to methe sauvage, stored in bottles and displayed in front of the kitchen. Ask him about these, and he will gladly tell you that he sourced everything (with the help of a friend) from the French alps, and that he plans to add even more eventually. The herbs are used in cooking, which help to showcase his strong background in French cuisine, mixed in with a few surprises here and there. Take the L’oseille (sorrel), for example. It may seem like a classic French appetiser with foie gras, but it has a burst of different flavours with slightly salty eel, refreshing oseille sorbet and sweet-citrusy apple flower syrup in one mouthful. The marbled and braised beetroot salad deserves a mention, too; its sweet earthiness complemented by the cured salmon. With the rise of healthy eating in the past few years, chef has also included vegetarian options, like the La Reine Des Pres. It’s well thought-out, as the celtuce is braised until tender and the addition of dried seaweed strips, pickled onions give it that needed lift. Strips of asparagus are laid on the plate, not just for décor purposes but for extra crunch you’ll love. If you can, order a fish dish like the L'Achilee Millefeuille or French seabass. Our idea of delectable fish has crisp skin and succulent meat—and it hits all the right spots. The fish is laid on strips of garlic sticks, with a side of garlic puree for heady notes, and the sesame achilee crumbles give it a nutty finish. Instead of beef, try the 500g pork belly lightly seasoned with pepper and drizzled with pork jus. It’s mostly meat and no fat—which is a good thing—and when served with black and yellow carrots, which makes for a less sinful indulgence. Save that for later, with the macaron made with Black Colombian coffee, jelly speculoos cream and cocoa sorbet. It may seem like a giant dessert but trust us, you’ll be cleaning up this delicious dish in no time.